Located just about 7 miles southwest of Walker. 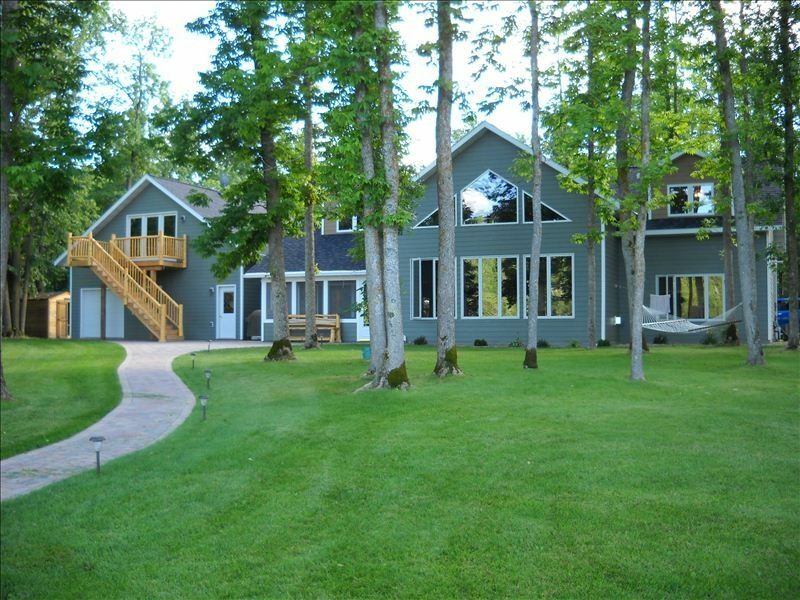 Vacation with your friends and family at our large lakehome, situated on a quiet bay of secluded Howard lake. Our home is large enough for multi familys with large bedrooms, 5 bathrooms and seperate apartment above the garage. Fish from the dock (or your boat) on this spring fed deep clear lake. Enjoy the sounds of the many loons that call Howard lake home. Paddle the canoe or paddle bikes to explore all this secluded lake has to offer. There is no developed public access on this lake, so it is very quiet but we do have a place that you can launch your boat. With cabins on just a portion of the lake, you are sure to get the true 'up north' feel your after. We have ample parking for all your cars, trucks and trailers, level lakelot with plenty of shade and beautiful crystal clear water, home to many species of fish and even more loons. This is a new home with approximatly 4,000 square feet and has something for everyone. Fishing is excellent, swimming is great and no matter what time of year, there is plenty to do. Winter is also a great time in this area with the great snowmobile trails, sledding hills, ice skating, skiing, snowshoeing, ice fishing and more. You will find everything you could need in our home for a great vacation. High speed internet for the person who needs to check into work now and then, or just for the convenience of surfing the web. The apartment above the garage has its own kitchen, large bedroom, bathroom with shower and fireplace with flatscreen tv. The main greatroom has flatscreen tv. with Direct T.v. and dvd. The decor is definitely 'northwoods' and has many mounted animals etc. The house, patio and garage are wired with stereo and cd player with controls in each room. Our rates for the fall and winter are basic and will be determined by the number of guests, inquire for specifics. New for 2014 is a totally renovated garage into a game room with Ping Pong, foosball, gaming system (central air conditioning) and more. We are a 'family orientated' Lake home and are not interested in hosting Bachelor/Bachelorette party's or Weddings, Thank you. My wife and I built this home as a dream getaway for our families. Of course with children and work, we can't be there all the time so we are renting it out on a limited bases. We are non smokers and do not allow pets on the property. We love to fish, hunt and spend time with our families. Being that this is our 'home away from home' you will find some of our grocery's in the cupboards but trust me, there is plenty of room for anything you bring. We want you to feel right at home, so use what we have if needed,all we ask is that you replace what you used. Sometimes a person forgets something or runs out of a certain thing they need, so we don't mind if you help yourself. This area is so great for anything a person wants to do. We have the smaller lake living with close proximity to Leech Lake. You can be from our door to the landing on leech lake in 10 minutes. Great fishing is right here. Our property is very quiet,so much piece and quiet, you will be amazed! Howard lake has no maintained public access, so it is very quiet here. Deep clear water, lots of loons, just really quiet. The 2 stall garage is now the game room and has air conditioning. Towels are provided but on occasion may need to be washed upon arrival (washing machine and soap provided). You will need to bring your own beach towels however. We have 3 refrigerators. One in main kitchen, one in garage and one in the kitchen of apartment. Keurig machine also, so bring K cups! You will find a variety of baking items and spices in the cupboards, we just ask if you use a lot of them, to replace at your discretion. Full kitchen with all the amenity's you would find in your own kitchen (maybe more). Wide variety of reading material, mostly adult but some children and teen books. New for 2014, garage is now the game room with ping pong, foosball, electronic dart board, flat screen tv with Wii gaming system. Canoe and 2 waterbikes for your use included in price. We have 3 bicycles on the property for your use as well as 2 water bikes. Stereo system for all downstairs rooms, garage and patio. In floor heat along with forced air furnace, central air. Full apartment with full kitchen and full bathroom above garage, gas fireplace air conditioning and tv also. Main level of home is all tile with the exception of the master bedroom. Every bedroom has its own bathroom. Attached 2 stall garage, lots of parking with a circle drive for easy parking with trailers. Large paver patio with pavers right down to waters edge. Screenporch on lakeside of house overlooking patio area. Level lot with level sand beach, canoe, 2 water bikes included. We built this home just 5 years ago as our dream vacation destination and want to share it with you. You will find most anything you will need, just bring your cloths and food. We have many board games, movies etc to keep the family entertained during your stay. Ask about the pontoon boat as it is available also. We are located right near the paved bike trail, snowmobile and forest roads. Beautiful home!! Lot and lots of room for our Girls Weekend! Fun shopping in Park Rapids. Weather was yucky but the house was so perfect. We stayed here last year also. High marks for this property!! Another fantastic stay at this property. Have taken my family here multiple years and it never disappoints! TRULY AWESOME LAKE HOME! ABSOLUTELY PERFECT GET-AWAY! This secluded, beautiful lake home ranks at the top - the best of the best lake vacation places! A 5 star rating does not do it justice - it is much better than that! Everything here is terrific! This is the perfect place to relax, unwind, forget about the busy-ness of home, and re-connect with family and friends! Everything in the description is accurate. The spacious kitchen is fully equipped with everything a large group could possibly need. The large table worked great for our whole family, comfortably seating 10 people. Others in our family who have traveled more say this is the best fully equipped kitchen they have ever seen! The bedrooms are very large with many beds to choose from. An added bonus for large groups - each bedroom has it's own bathroom! If you need more room, the apartment above the rec room is an awesome added feature complete with a kitchenette and beds for many more people. The decor throughout the entire home is truly the "Up North" feel and experience. The views of the lake are great. The home is complete with all the fun toys - both indoor and outdoor - so no matter the weather there is always plenty to do. Ping pong, foosball, game table, tons of Wii games, board games, puzzles, cards, DVD's, books. Sandy beach, great U-shaped dock for fishing from, canoe, paddle bikes, paddle board, raft to swim to, hammock for relaxing, pontoon to rent, and an awesome fire pit area by the lake for those evening gathering times and making s'mores. ACCESSIBILITY - This is the best feature by far of all the lake places we have ever been to. The "pavers sidewalk" from the home and patio makes it so easy for one in a wheelchair to get to the lake and dock and onto the pontoon. It was great to wake up to see my husband who is in a wheelchair, already out fishing at the end of the dock - able to get there on his own. And, really truly, he caught a 30" northern off that dock! ANOTHER BONUS - NO mosquitoes! We have stayed here 2 years in a row and have never had to deal with the bugs! The host, Jeff, checks in with us before our trip to see if we have any questions. He is always available via email and phone if any question arises and responds promptly. Thanks, Jeff, for all you do to make this an awesome vacation destination! This is a place everyone wishes was their own! Thank you for sharing your beautiful lake home with our family! Our family, 8 adults and 6 kids ages 3 to 10 enjoyed our stay so much!! The house was clean and well supplied which was much appreciated. The kids had a great time fishing from the dock. Jeff, the owner was very prompt with any questions we had. Our family included 8adults and 5grandchildren. We could not have been at any better place. The accommodations were excellent and Jeff and Barb are such wonderful people..our grandchildren never stopped playing, fishing.games and just being outside in the water and sand. They were never bored or ever asked what could they do. We went on the pontoon a couple times during the day and just relaxed and rode around on the lake. It was peaceful..we heard the loons talking and the lake was calm and not a lot of traffic on the lake making it a smooth ride. There was plenty of room in the house and everything we needed was there. Thanks Jeff and Barb for sharing your beautiful home..it was perfect. We just spent our third year at this beautiful home. It has so much to offer. The beach is perfect for our young children, the dock provides plenty of room for everyone to fish, and the water bikes were a great way to enjoy the amazing scenery. There is also a fire pit close to the lake which we sat around every night to visit or eat s'mores. The home is spacious and well kept. Everything inside is top notch. The kitchen has anything you may need. The game room provides activities like ping pong, foosball, and a gaming system. The main living area is beautiful and has a perfect view of the lake. We love everything about this place. Jeff, the owner, takes great care of his home and his guests. This is an amazing property! We are located right near the paved bike trail, snowmobile trails and endless atv. trails. We are only 2 miles from the sledding hill. There is a live theatre just 4 miles away. Golf, tennis shopping and more is just 7 miles away. Our fall and winter rates are based on the first 4 adults. I will quote each individual group once I know how many kids and adults. The cleaning fee will be based on the size of rental as well. Just email me for a quote.